ALTO is the name given by Linnaeus University to a project to build a wide-field Very-High-Energy (VHE) gamma-ray observatory at high-altitude in the southern hemisphere. The location in the southern hemisphere is motivated primarily by the privileged position for observing the central region of our Galaxy and by the fact that another observatory of the same technological “family”, the High Altitude Water Cherenkov (HAWC) gamma ray observatory is currently taking data in the Northern hemisphere near Puebla in Mexico. 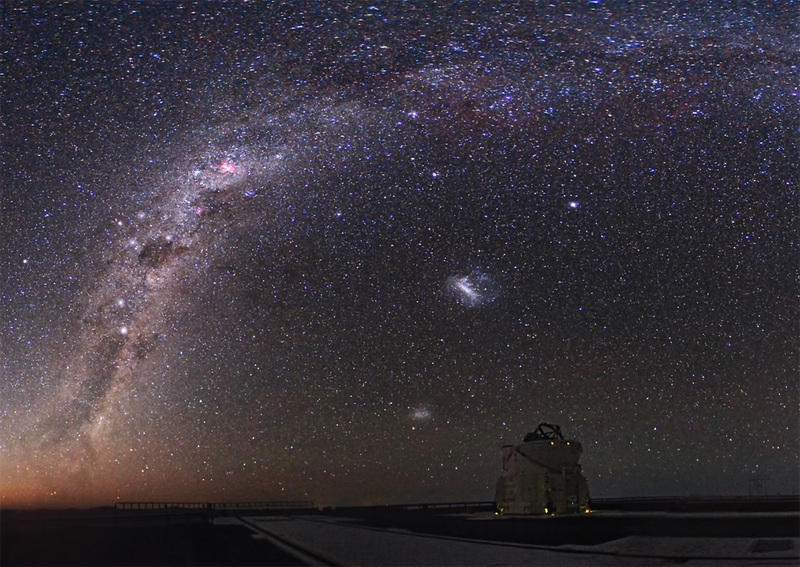 Being positioned in the northern hemisphere, the HAWC observatory can only marginally cover the southern sky. On the other hand, with ALTO being installed the southern hemisphere, it will be possible to continuously observe the centre of our Galaxy and, as an example, to observe one of the most interesting and nearby extra-galactic sources, as for instance the nearest radio-galaxy Centaurus A. Thus, with ALTO it will be possible to study gamma-ray sources in our Galaxy and beyond, and investigate the origin of Galactic and extra-galactic cosmic rays. The operation of ALTO in the Southern hemisphere will both complement the VHE observations by HAWC, and will act as an all-sky monitor and alert system for the southern part of the future Cherenkov Telescope Array (CTA) observatory. CTA and HAWC/ALTO represent the state of the art of the detection of VHE gamma-rays with the Imaging Atmospheric Cherenkov Telescope technique (IACT) and the Water-Cherenkov Detector Array (WCDA) technique, respectively. ALTO will be constructed to study cosmic VHE gamma-rays above the energy of few hundreds Gigaelectronvolt (GeV), which are the messengers of the most powerful phenomena in the Universe. The detection of VHE gamma-rays bears witness to the presence of relativistic processes in the vicinity of black holes, in Pulsars, in Supernova Remnants and in Active Galactic Nuclei. The goal of ALTO is to reach a sensitivity which is a factor of at least 5-6 better than the current HAWC sensitivity. Such a sensitivity would allow to catch VHE AGN flares and thus to study the black hole/jet emission in more detail. The full ALTO array will provide unique and excellent scientific output in the search for VHE emission from Cosmic Gamma-ray sources above a few hundred GeV from the South, including AGN detection and monitoring of AGN high flux states. So, ALTO will be uniquely placed to complement the Southern site of the CTA observatory. For ALTO, there are a number of points through which the current design of WCDAs can be improved as: the altitude of the observatory, the use of a layer of scintillator below the water tank, the construction of smaller tanks, and the use of more precise electronics and time-stamping. By increasing the altitude of the observatory location one can approach the point at which the number of particles in the gamma-ray induced shower is maximum, and this gives the possibility to decrease the energy threshold of the gamma-ray events. In particular we plan to increase the altitude up to 5.2 km which allows a decrease of 40% in the energy threshold with respect to HAWC. The construction of smaller tanks with respect to HAWC will allow to have a finer-grained view of the shower particles on the ground which helps in the reconstruction of the arrival direction of the incoming event and in the background rejection. 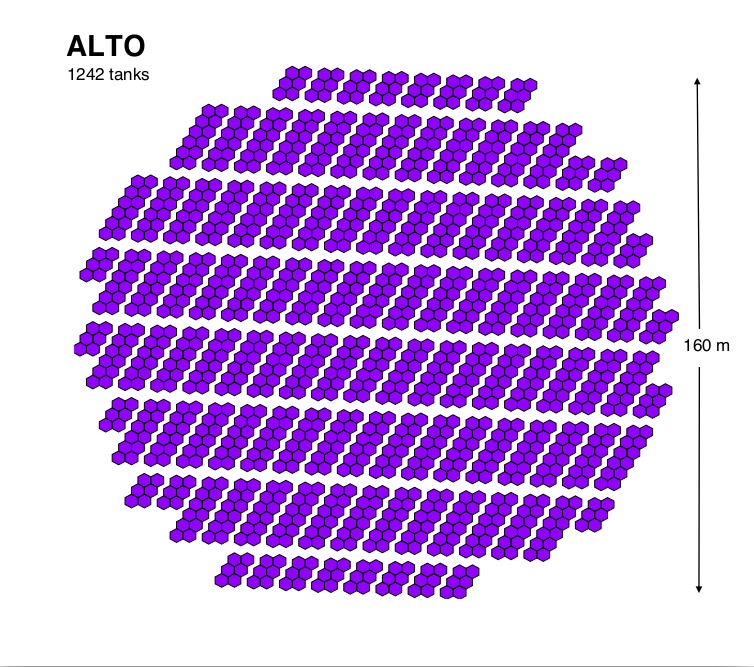 The current design of the ALTO water tank is hexagonal, so as to be close-packed. In our current ALTO design, we have added of layer of scintillator below the water tank. This is very important in order to be able to “tag” the passage of muons, which are the almost unambiguous signature of the nature of the particle cascade, as background proton-initiated showers are muon-rich. 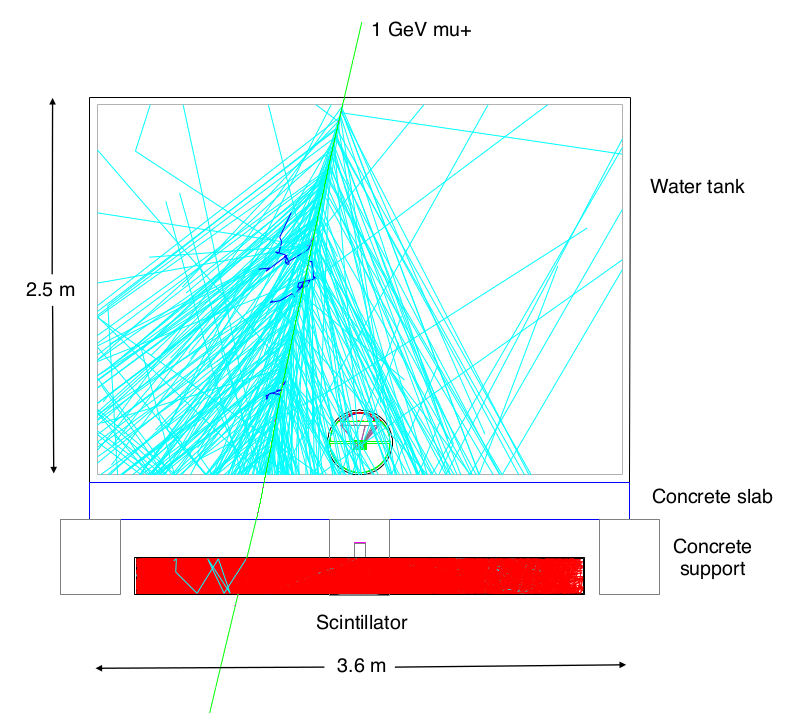 The implementation of this new “muon-tagging” allows to reach an increased signal over background discrimination by analysis, and thus allows an increase of the sensitivity of the detection technique. One of the solution for the liquid scintillator under consideration is a non-toxic oil with some non-toxic dopants which is relatively cheap, while being effective and environmentally friendly. ASIC Analogue Memories allow to store an electronic signal for a short time in a circular buffer (Switched-Capacitor Array, SCA), only reading it out if a trigger condition has passed. For systems where the read-out is not continuous, but happens in “windows” at a low rate, this allows the digitization to be done at a slower rate, avoiding the need for expensive, fast, and power-hungry flash Analogue to Digital Converters (ADCs). For ALTO we propose to take advantage of the improvements in integrated electronics which have been made in the last 10-15 years, in particular for the aspects of the Analogue memories and the timing distribution. For the prototype we are using the WaveCatcher electronics.